Chile Lindo on Video; Bi-Rite’s Canning Queen – Listage – Eater SF. Negocios de la Misión luchan contra demandas judiciales « El Tecolote :: 40 Years en la Misión. The Girl from Empanada… world travel! The places my empanada basket has taken me, could compete with any world wide expedition. Stay tuned. Our espresso machine is up and running, we serve Caffé D’Melanio’s fresh roast coffee, and our Café Mocha is prepared with homemade fresh whipped cream. After remodeling for months, it’s ready… our 16th Street location is open for business once again! Beef (”Pino”) – Freshly kneaded dough, rolled to size, is folded over the stuffing, raisins, black olive, and slice of hard-boiled egg, into a traditional savory, crusty pastry shell. The stuffing, called “pino,” consists of minced meat (Niman’s Ranch free range beef) and sautéed onions, seasoned with paprika, cumin, salt and black pepper. Once baked golden brown the mix of flavors makes for a delicious meal. Cheese-Jalapeño – Freshly kneaded dough, rolled to size, is folded over cheese & jalepeño and baked to perfection. Fresh out of the oven, empanadas are at their peak! We also serve fresh hot coffee, and have a selection of soft drinks. We plan to add more authentic Chilean delicacies to our menu as we grow… so be sure to check back. 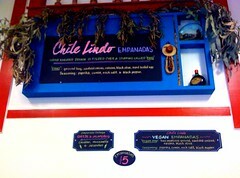 Thank you for supporting Chile Lindo!